It is worth asking why this wonderful plan was not presented and executed when Hugo Chavez and his party enjoyed almost absolute power, a time when there was only minor opposition in the National Assembly. Are they now trying to do what they could not do fifteen years ago? Some fools actually believe this! Chavism along with Castro-ism are mutant economic failures which do not follow any laws of economics, relying instead on volunteerism and improvisation, practices which carry no assurances of success. Since the Venezuelan president’s current plan relies on these methods, the results can be expected to be minimal, especially given all the commotion and propaganda accusing the opposition beforehand of not being able to implement it. They will make good use of the profusion of enormous portraits of Bolivar and Chavez, with which they have dementedly used to adorn all of Venezuela, a demonstration of ignorance and fanaticism alien to the noble history of the Venezuelan people. There were those who demanded respect for election results — whatever they might be — when they were convinced the opposition would lose in a landslide. Now they are trying to undermine the recent outcome through subterfuge, slander, lies and other petty, unethical arguments while taking advantage of the hold they still have over the Supreme Court, which remains blatantly partisan. It will fool some of the people — the usual bunch — but not most Venezuelans. Fernando Damaso, 9 January 2016 — In Venezuela it appears that the “Chavista circus” is coming to the end of its work in some public spaces, in this case in the Legislative Palace where the National Assembly meets, from where some portraits of the “eternal president” — as designated by himself before his death — have been removed, leaving only those of the Liberator Simon Bolivar, uncontaminated and unadulterated by fanatical Chavez propaganda. This practice of placing yourself under the protective shadow of some independence leader to better sell yourself to the masses, seems to be a tactic conceptualized by the majority of “populist” Latin Americans: their principal victims being Bolivar, Sucre, San Martin, Marti and others. 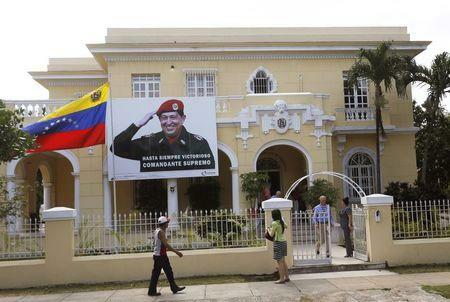 The Chavistas have extended this practice to their embassies and here, in Havana, on 5th Avenue in the Miramar district, they have imposed on us an enormous photograph of their smiling “eternal president”on the facade of their embassy. Fortunately this bad example has not spread, freeing us from converting this avenue and others into a portrait gallery of different specimens of political fauna, further spoiling the city. Mr. Venezuelan Ambassador can put a photo of his “eternal president” any place he wants in the building, even in the bathrooms, but should not impose it on every Cuban who travels down that avenue. In addition to a provocation, it is disrespectful, because not all of us commune with the ideas of the man in the portrait, and it is a violation of public adornment laws, which should be taken into account by the appropriate authorities. Given what is happening in Venezuela now, it is being demonstrated more convincingly every day that the Supreme Court has been an organ subjugated to Chavismo, and has been used and is being used to legitimate its misdeeds. This is happening right now with the absurd contesting of the election results obtained by some deputies, which shows that the court lacks impartiality and, what’s more, credibility. The same thing is happening with the TV channel TeleSur, which is nothing more than a propaganda channel for Chavismo and Latin American “populism,” lacking seriousness and, even more so, impartiality in its judgments, offering only manipulated news, convenient to its own interests. Everything that is happening today in Venezuela, should serve as in incentive for many to finally understand the real danger of “populism” and the need to remove it from our continent, if we want to progress, develop ourselves, and march in step with the world, not against it. Fernando Damaso, 1 January 2016 — The Cuban authorities and their organizations inserted into civil society, have launched a fierce media campaign against the politicians elected by the majority of their citizens to hold public office both in Argentina and in Venezuela: in the first case, the presidency of the country, and in the second a majority in the National Assembly. Reading and hearing the statements, it seems that the Argentinians and Venezuelans have mistakenly given their votes to criminals, traitors, mercenaries, and other anti-socials, denying those votes to the “good and self-sacrificing Kerchnerists and Chavistas,” the “eternal patriots” of their respective countries. There is nothing new here, despite all the carrying on by those who cannot lose gracefully. We recall that, contrary to the will of the majority of Puerto Ricans, both the Cuban authorities and their related organizations called for the “independence” of Puerto Rico, although only 4% of the population showed an interest in this while 96% rejected it. Things of primitive fanaticism! Nor do they cease to express their support for an expansionist Russia, the Syrian dictatorship, the Columbia drug traffickers, and all those who speak ill of the West or act against it. Now they ask for support for Chavism in Venezuela, talking about external interference, while President Maduro invents new tricks to remain in power. It seems that the seven million votes achieved by the opposition came from outside the country, and were not deposited in the ballot boxes by Venezuelans. There is also talk of a strange union between the Chavistas and the civic-military forces to confront the new National Assembly. “Something is rotten in Denmark,” as Hamlet would say. Nor is the Argentinean president immune to the populist-leftist onslaught. Fernando Damaso, 18 December 2015 — Cuban authorities as well as organizations that make up the so-called official civil society have unleashed a ferocious campaign against politicians elected to public office by a majority of their citizens. In Argentina it was a presidential election while in Venezuela the opposition won a wide majority in the National Assembly. Hearing and reading their statements, one would think that Argentinians and Venezuelans, lacking political maturity, had mistakenly cast their ballots for criminals, outsiders, mercenaries, traitors and other anti-social types instead of for the good, noble and selfless kirchernerista and chavista candidates, the “eternal patriots” of their respective countries. Such out of control hysteria is nothing new given the outcry from the losers. Remember that, despite the expressed will of a majority of Puerto Ricans, both the Cuban authorities and their affiliated organizations continued to clamor for Puerto Rican independence, something for which only 4% of the population voted and which 96% rejected. There is similar support for the FARC narco-guerillas, who are now in negotiations with the legitimate government of Colombia, which was duly elected by a majority of its citizens. Unfortunately, there are many other similar examples in all parts of the world. Illustrations of a primitive fanaticism!